Did you think the Olympics was the most spectacular event you could ever witness ? Then you obviously missed out on the heartwarming Special Olympics World Games in Los Angeles. For everyone involved, "LA2015" saw thrills, triumphs and plenty of fun and inspiration with none other than First Lady Michelle Obama taking part in the Opening Ceremonies. 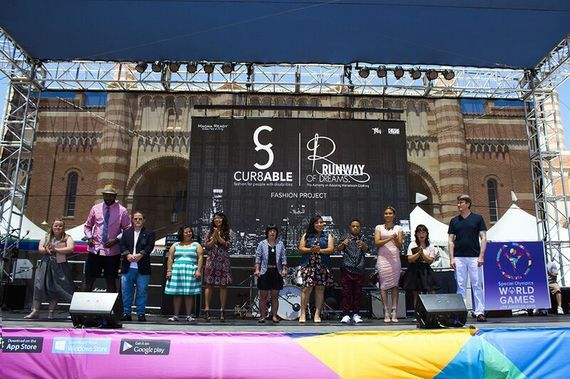 As the two USA Special Olympics World Games basketball teams flaunted stylish disability-friendly "Flyease" Nike sneakers designed by Tobie Hatfield; Cur8able joined forces with Runway of Dreams to produce "The Fashion Project". Freshly arrived from Paris couture week, I followed a dream team behind the scenes. 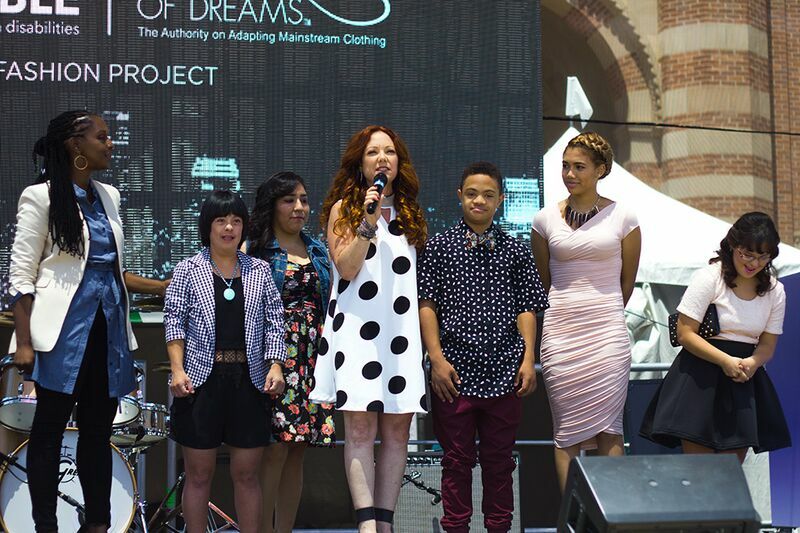 July 26, 2015 - Athletes and Coaches share "The Fashion Project" stage at the Special Olympics World Games (UCLA). More than a runway show celebrating Special Olympics Athletes and Coaches, "The Fashion Project" was a laudable initiative bringing awareness about fashion that is not only inclusive but empowering. 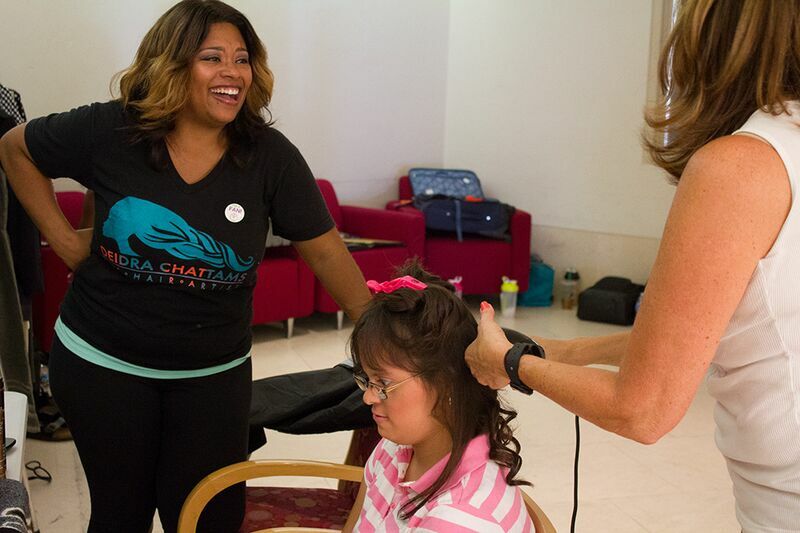 Born missing digits on her hands and feet, Executive Producer and Cur8ble disability stylist Stephanie Thomas overcame all obstacles. For 23 years, she has curated clothing for people with disabilities and raised awareness about this arcane fashion. 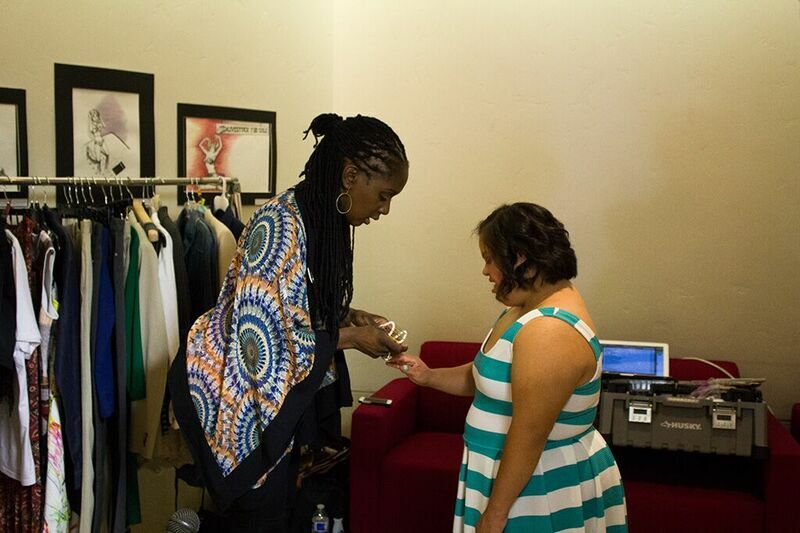 Backstage - Thomas styles Track & Field Athlete Angela Armenta, one of the first women with Down Syndrome to run a competitive marathon coached by Cristina Shente (ARC). Thomas pulled a full rack of designer pieces from Bloomingdale's including Michael Kors, Kenneth Cole and DVF. Mindy Scheier altered some of the designs using Magna Ready magnets instead of buttons. As simple as it sounds, this is a brilliant solution for someone with dexterity difficulties and at large, anyone with little patience to button up a shirt. Autonomy and dignity are a must for Thomas who developed a disability fashion styling system with three main standards: accessibility, smart, meaning seamless functionality which does not harm the wearer and of course, fashionable. Who doesn't want stylish clothing? Mindy Scheier, Runway of Dreams Founder and mother to a boy with Rigid Spine Muscular Dystrophy explains the process of adapting mainstream clothing for the "differently-abled" as seen on basketball athletes Antoinette Mendoza ( second left) and 13 year-old Pierce Harlin (right). 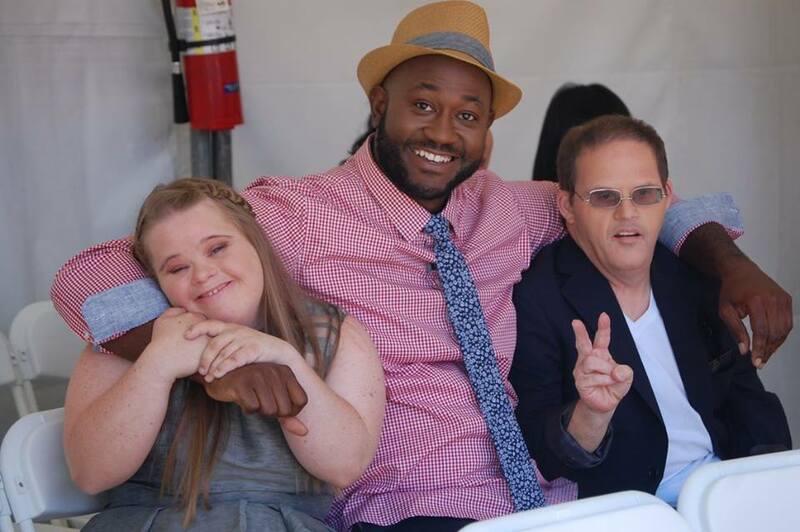 A thought leader in disability fashion, Thomas weighs in on "The Fashion Project" and Special Olympics World Games coinciding with the 25th anniversary of the Americans with Disabilities Act (ADA). "There is now easy store and dressing room access for seated body types fashion customers who happen to use wheelchairs for mobility. However, no retail real estate has been dedicated to serving their clothing needs." "There are literally more in-store clothing options for pets than there are for people with disabilities. This reality is proof, that you can not legislate positive perceptions of people with disabilities as fashion customers. Although the US ugly laws have been eradicated, their stenches still remain. "-Thomas explained. Despite extremely slow-paced industry changes, Thomas is optimistic about the future of inclusive retail shopping.
" I have seen more people with disabilities in commercial and print advertising in the last three years than ever before. "- said Thomas.
" Over the last five years I've met so many wonderful passionate designers of adaptive clothing such as Lauren Thierry of Independence Day Clothing and Karen Bowersox of Downs Designs Jeans. These brands would look great on the shelf in any retail store." -she said. Certainly, there is hope. Especially with wearable technology slowly but surely changing the narrative of fashion for people with disabilities. Track & Field Athlete Erika Gomez-Conejo coached by John Peterson (ARC) gets glammed up before the show. It's hard work putting together a show like this, but "The Fashion Project" was a labor of love. Beauty, fashion and entertainment professionals all contributed to the success of this amazing event including Gail Williamson from KMR Talent and Tangible Media Works who documented the show. "Our initial fitting with the athletes was a 12-hour day, but I felt energized. They instantly accepted me, hugged me, and made ME feel special! "- said Shirley Dalmas, Production Producer and Set Manager. Collectively, the four Activities Recreation Care (ARC) coaches involved have 25 years of experience coaching the Special Olympics. Actress Paige Hurd mentored sibling Pierce Harlin. "We enjoy coaching the Special Games because it provides us the opportunity to develop our athlete's health and wellness while highlighting core values like teamwork, encouragement, and hard work," said Michael West, ARC Activities Coordinator (pictured above by Gail Williamson). This year, West coached marathon and basketball athlete Jim Jenson (right) who has participated in the Olympics since he was a little boy and closed the show with epic dance moves. Shannon Dieriex (left) is a competitive athlete in swimming, gymnastics, softball & track and has won more than 40 gold medals. Dieriex is also an actress and Global Messenger for the Special Olympic Games. As Thomas beautifully summed it up," the games were full of celebrities, but the athletes and coaches are the super stars in our eyes."